(Ocimum basilicum) Organically grown Italian Basil plant in a reuseable bamboo pot. 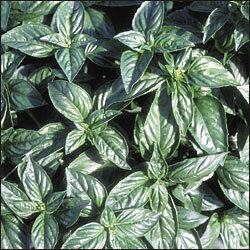 Basil needs full sun, but protect it from heavy rains and winds. Basil leaves, when eaten in foods or as tea, uplifts the spirits and make you feel good. So get a plant to put in your own back yard so you can have some for your meals every day. Soup Mix - 13 Bean - BRM - 29 oz.